Lou Gehrig died on the night of June 2, 1941, just a couple of weeks before his 38th birthday. His death, though foreseen, was difficult for many. As a result, memorials and tributes sprouted up everywhere. Even today the world is paying respect to Gehrig and all he stood for. June 3, 1941 -- Mayor La Guardia orders flags to be flown at half staff. Gehrig's Obituary appears in the New York Times. It includes mini-eulogies written and submitted by the likes of McCarthy, DiMaggio, Earle Combs, Jimmy Foxx, and Rogers Hornsby. June 4, 1941 -- Gehrig's funeral. The Yankee game scheduled for that day was canceled. Officially it was a rain-out, but in reality no Yankees player could think about baseball when the man who defined the team for so long was gone. Gehrig's cremated remains were placed in Kensico Cemetery in Valhalla, NY. A headstone was erected in his honor (though it has the incorrect birth year). July 4, 1941 -- The Yankees honored Gehrig by erecting a monument in Memorial Park, behind center field of the stadium. Lou Gehrig was one of only two players so honored by that time. July 1942 -- Pride of the Yankees, the film about Gehrig, premieres in New York. It was nominated for 11 Oscars, winning 3. The movie has since become the most widely played baseball movie, and a classic movie overall. War-time '40s -- Eleanor Gehrig and friends donated ambulances in Gehrig's honor to New York City emergency services. The sides of the ambulances read "Lou Gehrig Memorial." Ball fields throughout the country were re-named "Lou Gehrig Field." A Liberty ship carried his name. Best friend, Bill Dickey, bought $8,000 worth of war bonds to honor Gehrig (and help the effort for war Gehrig had predicted and dreaded since the mid-1930s). 1950 -- Longtime Yankee commentator, Mel Allen, whose game broadcast were a comfort to Gehrig duirng 1939-1941, was honored by the city of New York. He received many gifts and $14,000. He used part of the money to set up a scholarship at Columbia University in honor of Gehrig. August 21, 1953 -- Gehrig's birthplace, a four-story apartment building (that had been turned into a laundry) in Yorkville, is adorned with a memorial plaque: "This plaque marks the site of the birthplace of Henry Louis Gehrig." Christina Gehrig, Lou's mother, was at the unveiling ceremony. 1955 -- Phi Delta Theta Fraternity (Oxford, OH, chapter), began the annual Lou Gehrig Memorial Award, given to an MLB player whose work on and off the field best represents that of Lou Gehrig. 1969 -- The Baseball Writers' Association voted Gehrig the greatest first baseman of all time. 1976 -- Eleanor Gehrig publishes an autobiography, extensively discussing her private life with her late husband. The book was later turned into the movie A Love Affair: The Eleanor and Lou Gehrig Story; the movie is also considered a classic, and original VHS copies can sell for upwards of $50. 1988 -- Starting Lineup puts out a Sports Impressions series. Gehrig was one of the players honored in this series. Eight-inch tall ceramic statuettes in Gehrig's likeness were sold. Only 5,000 of these highly valued pieces were made. 1989 -- US Postal Service commemorates Gehrig with a stamp. Soon, other countries are replicating this memorial (Granada, in the Caribbean, also dedicated a stamp to Gehrig's memory). 1995 -- Curt Schilling, one of the best MLB pitchers today, wins the Lou Gehrig Memorial Award; he names his son Gehrig Schilling. Sept. 20, 1998 -- Cal Ripken, Jr., Baltimore Orioles, breaks Gehrig's consecutive games streak in Orioles Park at Camden Yards. In his address to the packed stadium, he called the ol' Iron Horse "the great and courageous Lou Gehrig." The crowd chanted, "Lou, Lou." late '90s -- Kenneth Gatewood, artist, releases an illustration of an infant-age Ripken, watched over by the spirit of Gehrig, with a bat and wearing a baseball uniform. The title of the illustration: "I Can Do That." Avon makes a baseball with the images of Ripken and Gehrig, companioned with the story that ties the two men together forever. 1999 -- MLB, with the assistance of MasterCard, releases the results their All Century Team vote. Fans everywhere were asked to vote for their favorite all-time players. The names of the top 100 vote-getters were released to the public. 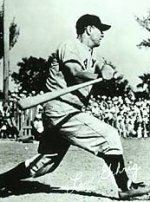 Lou Gehrig was not only voted as the first baseman for the prestigious pseudo-team, he received more votes than any other player in baseball history. 2000 -- Following the revelation of the All Century Team, Hasbro's Starting Lineup releases action figures, accompanied by a limited-edition baseball card, of 10 of the top 30 players selected. Among them, Lou Gehrig. Says the back side of the Gehrig action figure box: "This set is a tribute of the magnificent sport of Baseball and the greatest athletes who ever played the game." The Highland Mint collects the sawdust from a game-used 1932 Gehrig bat (the bat was cut into sections for display). Only 500 capsules of dust were released; they sold out within a week. May 2000 -- ALSA (ALS Association) begins the Lou Gehrig Challenge: Cure ALS, an in-depth research project that vigorously investigates ALS. ALSA committed to a 5-year, $25 million initiative, the largest commitment by any ALS voluntary organization. February 2002 -- A kid from the Midwest launches a Web site dedicated to furthering the public's knowledge of Lou Gehrig as a human being. May 31, 2002 -- Project ALS Day is held at 13 of America's ballparks. At each park, a celebrity guest read Lou Gehrig's famous farewell address from home plate. May he rest in peace and happiness.